The Earthwalk Northwest Apprenticeship Program is a year-long, intensive wilderness program designed to develop the inner spirit through learning to live in accordance with the laws of the natural world. The program is designed to teach a balance of skills from the ways of the past to the technology of the present. 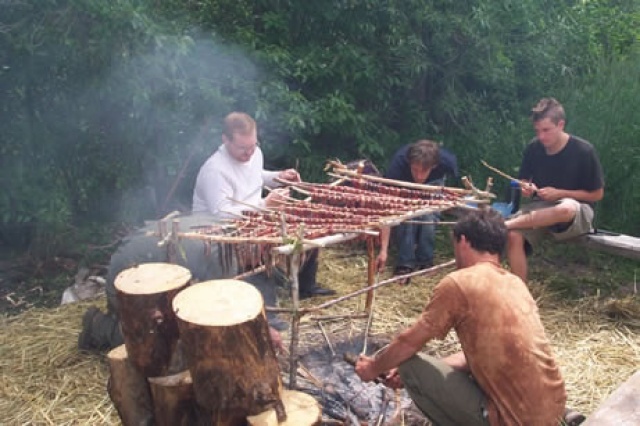 Students will study the skills of the hunter, the gatherer, and the caretaker, while developing an understanding of the connectedness of each of these roles. Students learn to appreciate themselves and their community through direct interaction with the many gifts of Mother Earth. In the ways of the old, the hunter was an accepted integral weaver of the web of life. The hunter provided life to their community and their environment by harvesting animals out of necessity and the utmost respect. During this portion of the training, students will learn to blend and flow with the rhythms of nature through advanced study of nature awareness, tracking, honoring the animal, primitive fishing, and the skills of the camp. Projects will include harvesting materials to create a fish net, then using it to dip out local migratory fish. Through this process, we will be learning about the relationship between hunter, gatherer, and ultimately caretaker, as we create an important healing oil from these fish. Wild plants can unlock the portal to good health and balance. This aspect of the program will take an in-depth look at how all beings are given life through the gifts of the plant nation. Students will learn to identify, harvest, prepare, and incorporate wild plants into their daily lives through edible, medicinal, and utilitarian uses. Weekly plant studies will focus upon the vast gifts of one plant species. Students will create an herbarium collection to enhance their plant studies. For the term project, students will create a new wild plant recipe to share at our end-of-year Potlatch ceremony. The caretaker aspect of the program will be divided between caretaker of self and caretaker of the earth. Within caretaker of self, participants will learn the value of using local plants for nutrition and health maintenance. The indigenous peoples relied upon these local species for survival and we have learned many lessons from them. The medicinal aspect of both plant and animal species will also be explored. In addition, students make a variety of salves, tinctures, and herbal mixtures to start their own herbal first aid kits. In learning about the caretaker of earth, we will be learning ethical harvesting methods to ensure that our participation in the natural world leaves a positive legacy for generations to come. How to make fire using a variety of methods. Schedule - Class is held Monday and Tuesday, 9 am to 3 pm, totaling 12 hours per week. Optional field trips may extend a class day or take place in the evening. There are also two weekend, overnight classes during the year. Included in the program are several open enrollment classes, from one weekend class in the classroom to week-long classes at a remote, wilderness site. Students are expected to work outside of class on certain projects, but the amount of time spent can vary. Although it can be as little as 1 hour per week, some students choose to spend significantly more time. Structure - Classroom time is a mixture of instruction and guided hands-on experience. Class time may include workshop time indoors, guided plant identification and foraging walks, or even a trip to the woodworking store. Location - Class is held at the Earthwalk Northwest classroom in Bellevue, WA, about twenty minutes east of Seattle. Trips into the field are held throughout the year to nearby wild places, as well as lower Puget Sound, the Pacific Coast, and Eastern Washington. Tuition - Tuition is $7,800 and includes 9 months of class instruction, class materials, and field trips. It also includes the additional classes of Backyard Blacksmithing and Knife Making, Wilderness Survival Trek, and Wild Edible Plants. Frank and Karen are enormously generous teachers, both with their time and with their energy. They hold no pretensions and are always willing to help and answer the myriad questions that come up in learning something new and exciting. Maybe more importantly, Frank and Karen carry between them over sixty years of teaching primitive skills. From those lifetimes of knowledge and skill, they have been able to develop in their students a remarkable confidence in learning to live with the Earth. of our primitive ancestors. Whether I was flaking obsidian or reverse-wrapping dogbane into cordage suitable for a dip net, the panoply of skills and proficiencies that Frank and Karen tender is amazingly broad. The only limit on learning at Earthwalk Northwest is in the time and energy the student puts into the experience.